Combine spice, sauces, sugar, guava nectar, garlic and ginger. Pour over the chicken and marinate overnight. 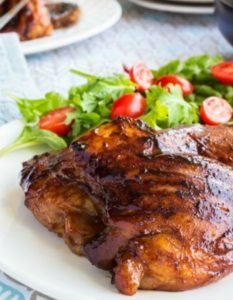 Bake, grill or braai chicken basting continuously until done. Cut guavas in half and remove the seed. Soak the seeds in a cup of water. Place guavas in a saucepan with the remaining water, bring to the boil, reduce heat and simmer until guavas are very soft. Strain the water from the seeds and add it to the guavas. Discard the seeds. 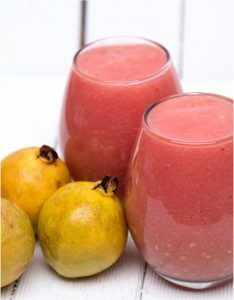 Puree the guavas in a food processor and place into a heavy kettle. Add an equal amount of sugar and cook over low heat stirring constantly with a wooden spoon until the mixture is thick. Test the consistency by dropping a little jelly onto the surface of an ice cube. If it can be lifted off in one piece, the paste is ready. Remove from heat and beat with a wooden spoon for 10 minutes or until it forms a heavy paste. Line a pyrex dish or pan with wax paper. Turn paste into it and allow to stand for 24 Hours. To store, turn paste securely into foil. For a dry consistency, place the cooked paste on wax paper and cover with cheesecloth. Place in the sun and allow to dry for 2 days, turning regularly. Blend all the ingredients together for 10 secs. Add 4-6 ice cubes. Blend on high speed for 30 secs. Garnish with a slice of pineapple and guava and enjoy! Wash approximately 2 kg firm ripe guavas. Peel, cut off stems and blossom ends. Slice the guavas. 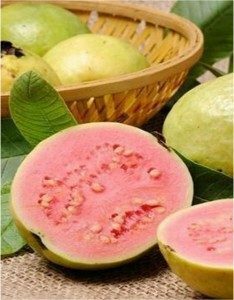 Boil the guavas in 750 ml water until soft. Push the cooked guavas through a sieve to removeseeds. Add 500 ml sugar for every 2 litres of nectar. Heat and stir until the sugar has dissolved. Add water until puree is thin enough to drink. 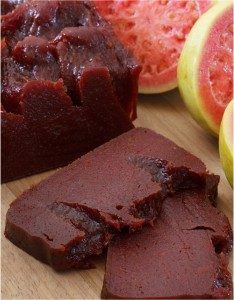 Hint: To freeze the guava nectar, place in an airtight container and allow 3 mm headspace for expansion. This will keep up to a year at 0 degrees centigrade. Peel firm and ripe guavas and cut them in half. Remove all the bruised and damaged parts of the fruit. Pack fruit in bottles to be used to measure them and then use syrup guidelines given below. Prepare the syrup by dissolving 250 ml sugar in 500 ml water and bring to the boil. (You will need more or less 250 – 350 ml syrup per large glass bottle and 125 – 200 ml syrup for a smaller bottle). Place the peeled guavas in the boiling syrup and cook for about 10 – 15 minutes or until froth starts to appear on top of the syrup or the pips start to loosen. Be careful not to overcook guavas. Overcooked guavas loose their pips. Remove the labels from the glass bottles for the cooked guavas by soaking them in water. Sterilise the bottles by boiling them in water for 30 minutes. All the bottles used must have metal caps and should not be cracked or chipped. 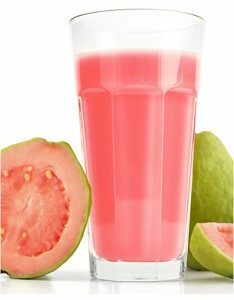 Remove the bottles from the boiling water and pack with cooked guavas and then fill with syrup to the rim. Remove all the air bubbles by inserting a knife against the inside of the bottles. Close the cap tightly and place the bottle upside down while it cools. This will ensure that the bottles seal properly. The bottles must be sealed tightly. Any bottles that leaks should rather be used immediately.